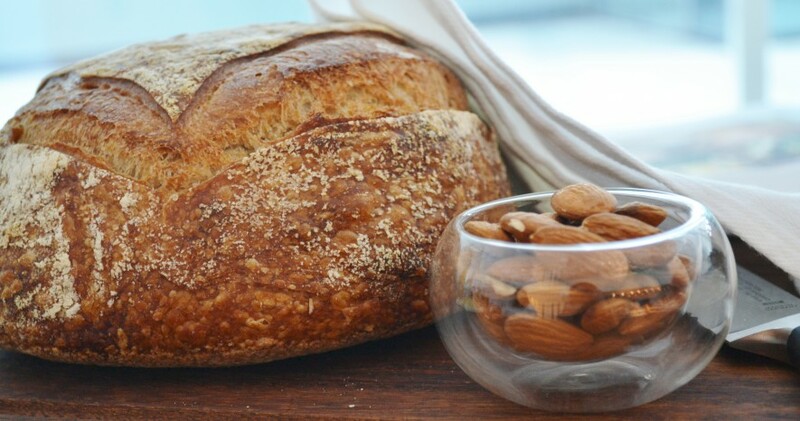 Now once in awhile comes along a great and heart warming concept that stirs the soul and you think “Hey it’s a wonderful World”.Most readers of my blog are fairly used to my regular recipe posts and the odd product review along with a some travel and culinary write ups. 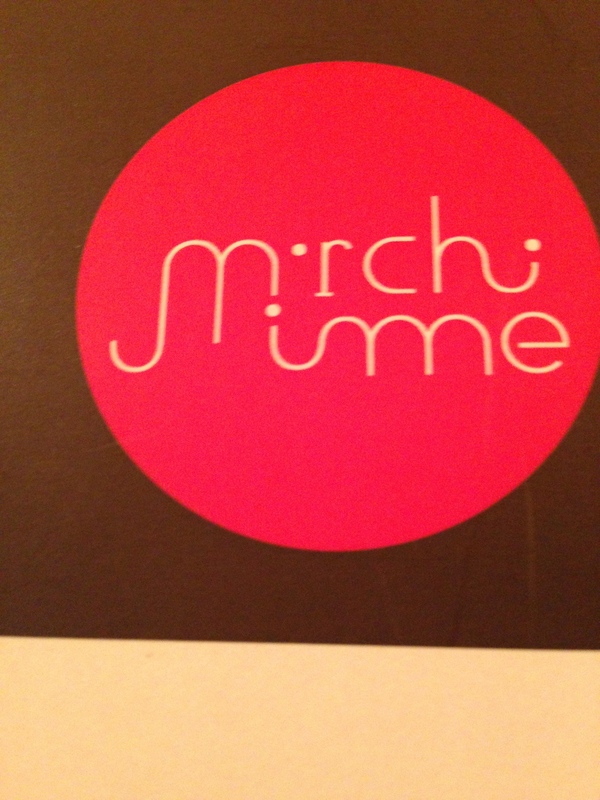 I must admit I’m not much of a restaurant reviewer,until my dining experience at Mirchi & Mime located in Powai Mumbai,last evening.This place certainly deserves a mention. Mirchi & Mime also know as M&M is a new fine dining and modern concept restaurant ,recently opened its doors in the neighborhood of Powai. This place has every ounce of success written on it. Kudos to the owners Prashant Issar and Anuj Shah for taking a giant step in employing an entire team of hearing and speech impaired individuals as their wait staff. A great initiative indeed in creating employment to the differently abled. The restaurant has a lively, warm and comfortable bistro like ambience, with a slight French appeal to the interiors. The open kitchen plan boasts of a variety of Tawa,Tandoori and Sigri styles of cooking.The staff is profusely cheerful, attentive and enthusiastic. They have been hand-picked from the Rochiram T Thadani Institute for the handicapped and trained for the hospitality industry. We were seated by our host and handed over the menu card, which very clearly and simply indicates the use of various sign language and gestures to enable the guest to communicate with the staff. Further more there are various sketches on the menu against each dish to ease the process of ordering. This place is abuzz at 9pm on a Thursday night with a constant turn around of tables. These guys certainly have a pulse on what ticks on the Menu. I would say the magic mantra for this place is the Co owner Prashant’s impressive 20 year hospitality background as General Manager at Chutney Mary’s and Amaya and various other top positions with hotels in India coupled with the expertise of Senior Sous Chef Sameer Bhalekar who has trained and worked under the likes of Ferran Adria’s Tickets and Chef Vineet Bhatia’s Rasoi in the UK. The menu is simple and not very exhaustive, yet captures the essence of Fine Indian Cuisine. Perhaps not entirely progressive Indian, but veering towards Modern Indian, with a twist. 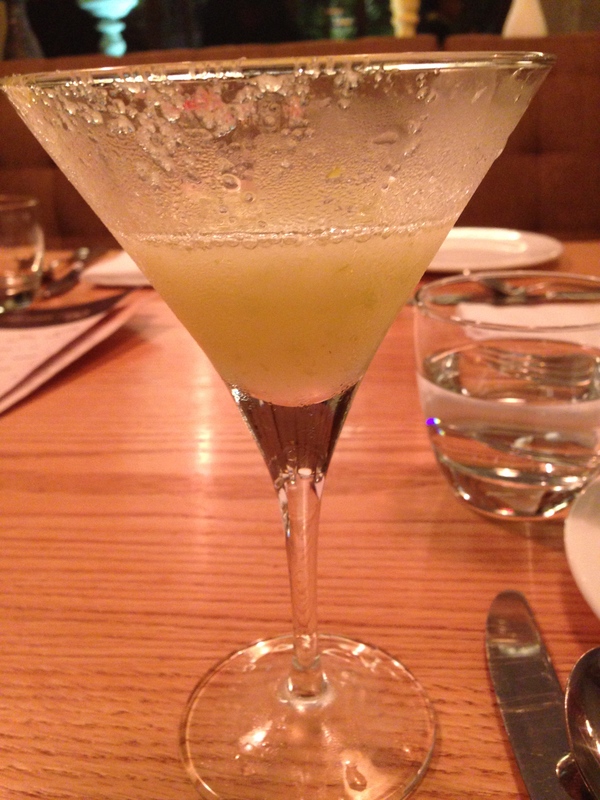 For a drink I settled for a refreshing Cucumber and Green Apple Vodka Martini which was brilliant. • White pepper Chicken: Succulent and juicy boneless chicken marinated in the best and finest of Tellicherry pepper. Mild and delicious flavors. 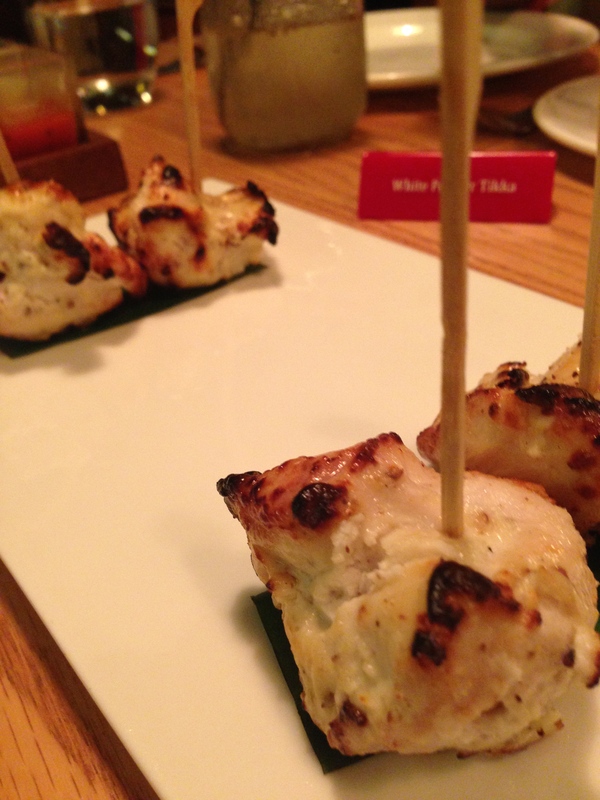 • Chicken Lollipop: A riot of flavors in here. Not for the faint hearted as a tad bit spicy. Smoky and bbq and hot and tangy flavors. Marinated with Bhot Jholokia. 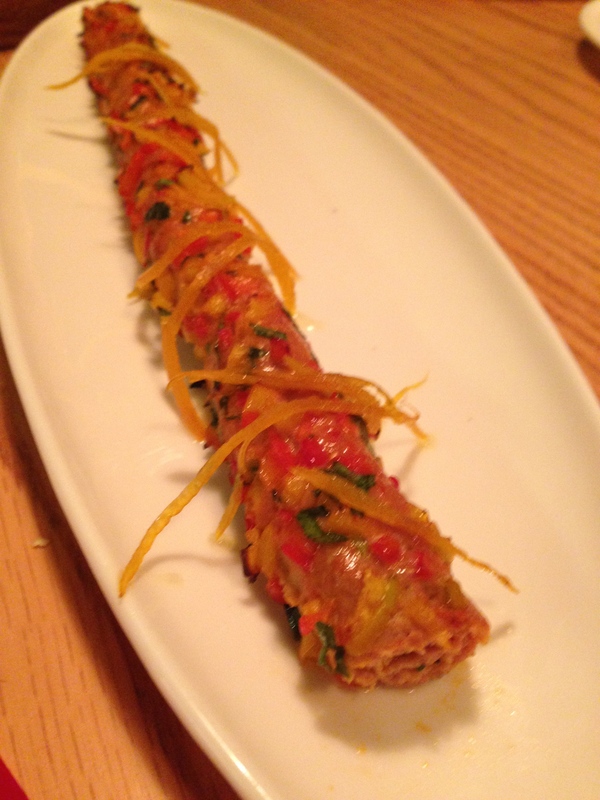 • Duck Seekh Kebab: Combinations of minced duck meat with finely diced peppers, mildly spiced and a lovely refreshing burst of flavors lent by the orange rind garnish. 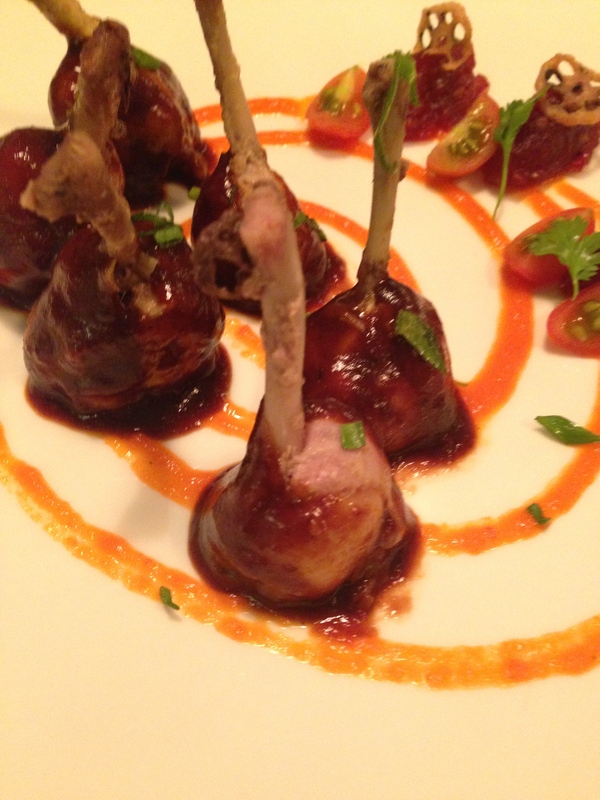 • Tandoori Quail: Delicious and tender as ever. Delicate smoky flavors. 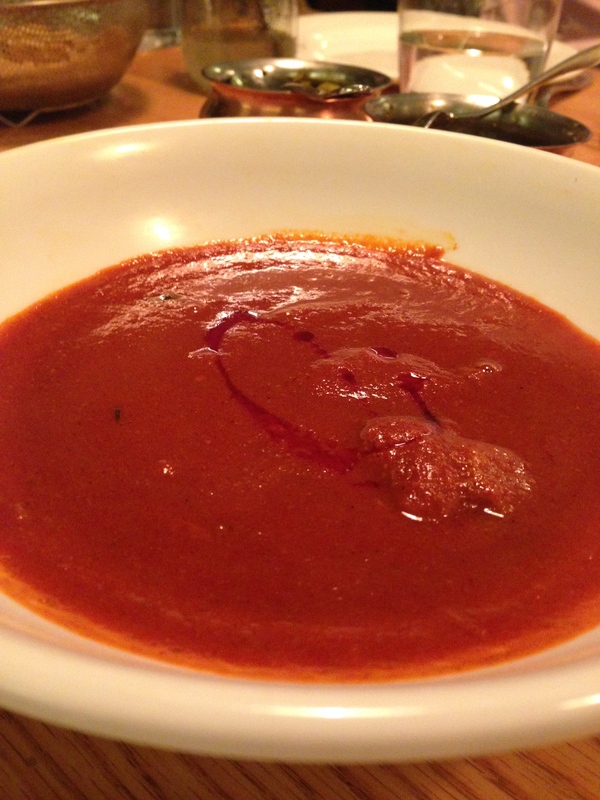 • Madras Mutton Curry and Naan: Really tender and melt in the mouth mutton cooked with madras curry. 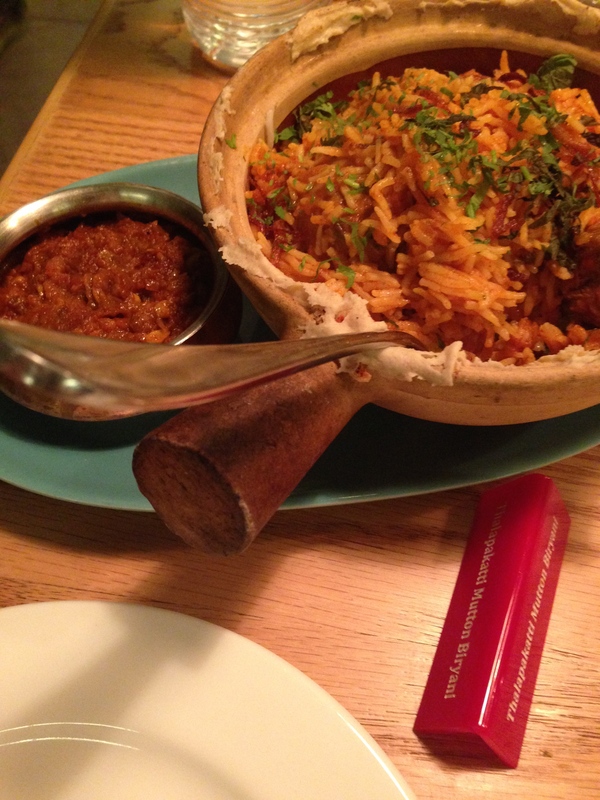 • Thalappakatti Mutton Biryani: Brilliant south Indian medley of flavors. Interesting use of curry leaves and mustard seeds. More like a lightly hand tossed biryani. Delicate and mild flavors. • Sitaphal Pannacotta: A Sublime flavor of sitaphal infused with cream makes this a light dessert. Best part was that it was sugar free. • Desi Cheesecake: With a Nankhatai biscuit base. Interesting however a bit dense for my liking. 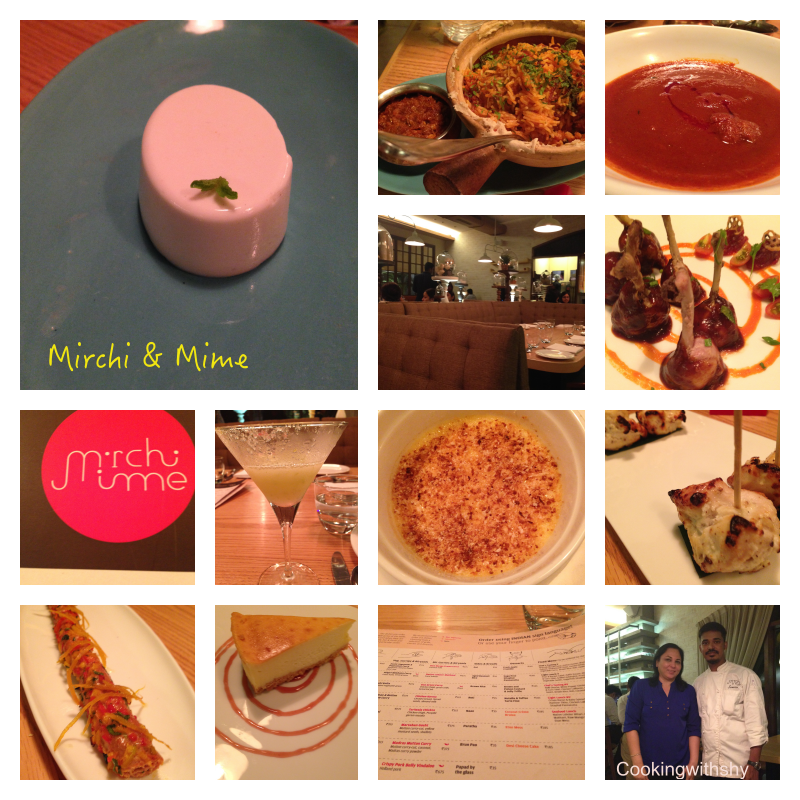 I had an excellent dining experience at Mirchi & Mime. Zomato rates this restaurant at 4.9 and I couldn’t agree more. A must visit.A double thumbs up for Mirchi and Mime…Their philosophy of Good Food served quietly certainly lives up to their standards. Interestingly the T-shirts worn by the wait staff read “I know sign language, what’s your super power” Well done and Bravo for this great venture. Disclaimer: I visited Mirchi and Mime on a friends recommendation and went their with my family and friends.The dinner was paid by me and all views about this review are my own personal experience. Thank-you. Well its does sound great! I love the name the most..mirchi & mime..its intriguing! 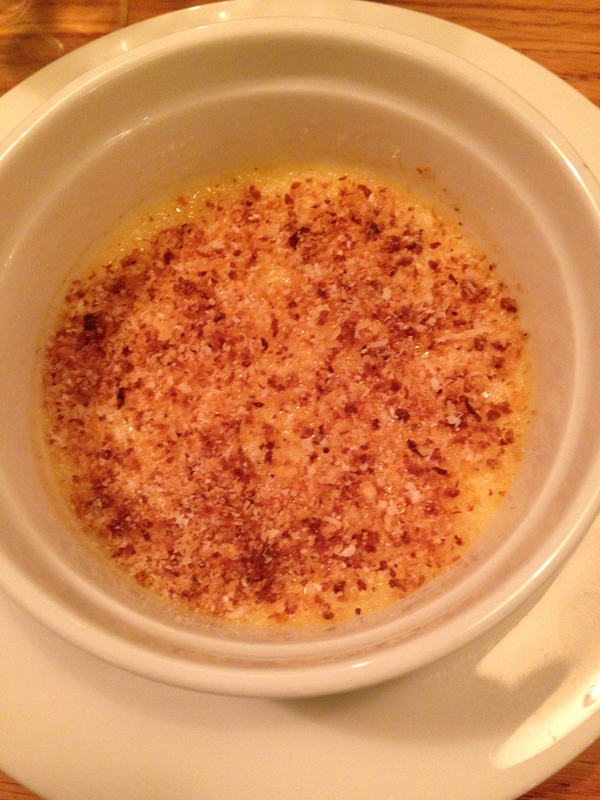 But that créme brulee steals the show..its my weakness.